Ok so firstly I know that it was World Book Day two weeks ago therefore this post will for sure not be helpful until maybe next year when people much more organised than me start to plan these things! (Side note, I did used to be one of those super organised people, no judgement there…maybe just a little jealousy!) In my defence though it was postponed due to the snow and I have seen so many posts shared across the last two weeks that it almost makes it feel ok.
As you can tell I don’t have the time or the planning in me to shop for the outfit before the day before nevermind blog about it in good time….maybe next year (she says to herself every single year!) To give myself a bit of credit like I said I did used to be good at all this and maybe one day I will be again but for now I live by last minute decisions and having learnt from the mistakes of years gone by putting all the effort (and money) into a costume only for Eva to decide she doesn’t want to be that character after all! So actually last minute high street shopping works. What I do always like to do if time allows though is a little bit of forethought to planning an outfit a little different, not one purely off the shelves ready made. I am not at all saying there is anything wrong with that of course. I think it’s just nice to look slightly different, unique with your own spin on a character and to be honest most of the reasons centre around what we either already have or can be reused and showing Eva the creative side of these themed days. Even if it does bring me out in a cold sweat every time the letter comes home. School mum problems! Most of her outfits so far have been a mash up of dress up, pre owned and new items. She has been Willy Wonka, Danny the Champion of the World and Miss Trunchbull, and this year is no different. 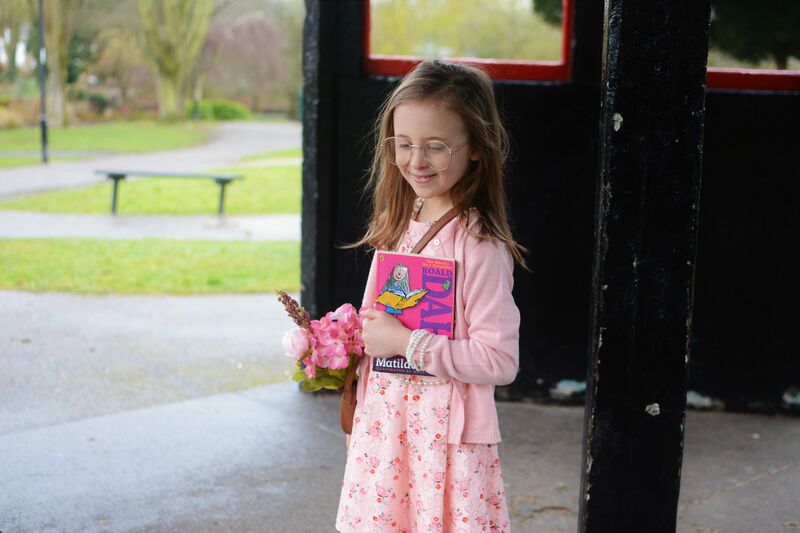 She decided very last minute she wanted to be Miss Honey after toying with Hermione and Mr Victor Hazel but her heart still always goes to Roald Dahl and particularly Matilda, a book worm after her own heart. This was her first favourite book to read when she was just 4 years old (which seems like a lifetime ago now) and although it has been replaced by Harry Potter of late it still holds a special place in her heart. 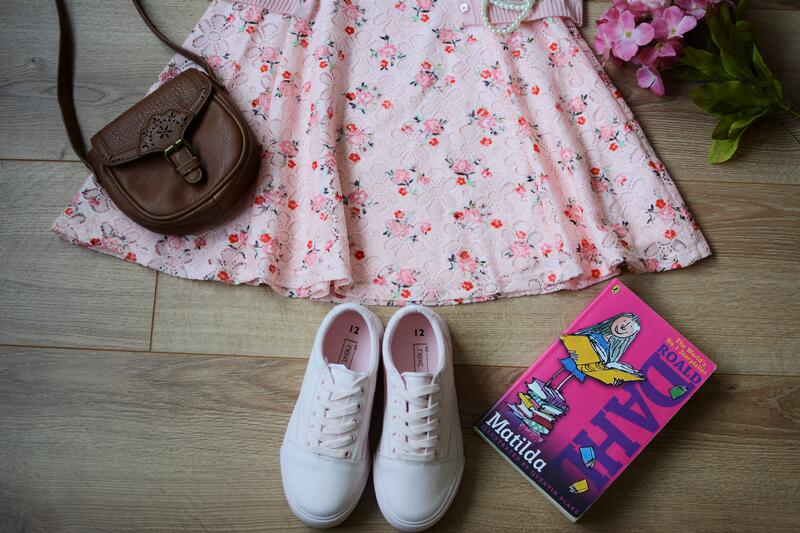 After scrolling google images and pinterest I went in search of a twee dress and matching accessories. 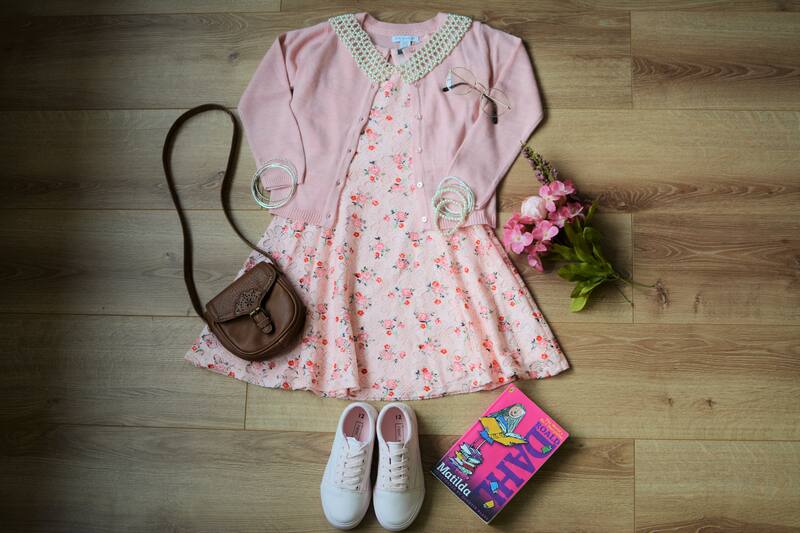 From Primark and Next I found this perfect pink ditsy floral dress (because Eva is one of the least girly girls I know who rarely wears anything ‘ditsy’ and dislikes pink therefore has nothing like this. I know it’s a random choice of character!) picked up a pink cardigan to match and these pink pumps too and that was it. 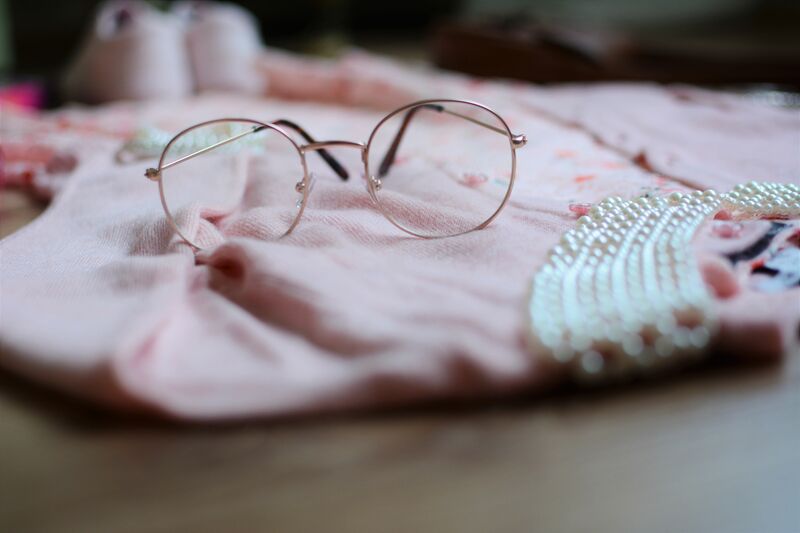 I added some round glasses from the adult section which actually fit her pretty well and all the rest is pre-owned either in their dress up or in my jewellery box! The bad came in handy too for her to put the flowers and the bracelets when she got fed up of them at school. Whilst originally she was going to wear little lace ankle socks, due to the fact it was -6 at the time, we added the thick tights to prevent hypothermia! Here we have one very very happy girl. 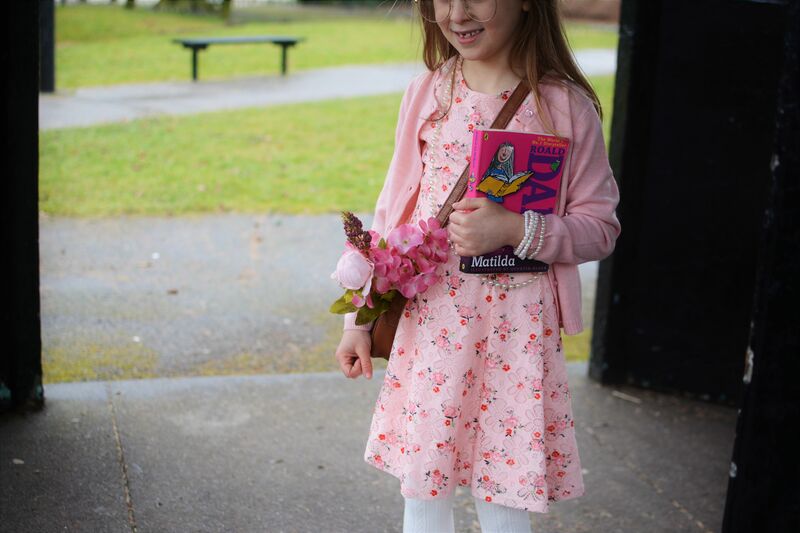 She literally could not wait to go to school and her little smile beamed as she walked in proud as punch. 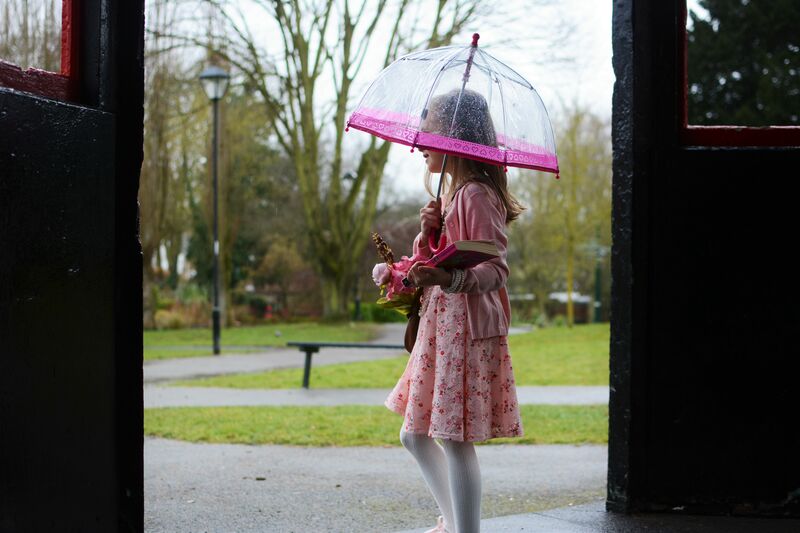 No she might never wear this dress again, yes the pink pumps might already be splattered with mud but even just for one day it was totally worth it, and who knows if we add it to the ever growing dress up pile maybe one day I will see Roma wearing the same thing too. 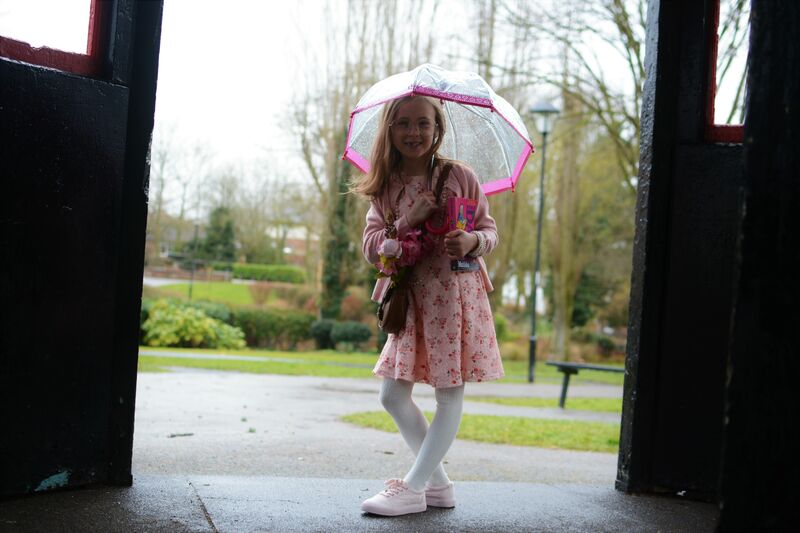 On the way to school we stopped off to take some photos, under cover to hide from the rain and I love them so much, even to the rain stained glasses she could barely see through, welcome to my world Eva! I already can’t wait to see what she chooses next year, and how well I will be organised in time…a year is a long time to change isn’t it? !